Joen’s knowledge of design is unparalleled. She is the most gifted teacher we have ever had the pleasure of taking a class with. Simply stated, she changed the way we approach our work. Through this book, everyone will benefit from her wisdom. As always the team at C&T Publishing have pulled out all the stops. This book is a visual guide to over 150 quilts, activities and exercises. It’s the equivalent of a double back flip, a somersault and a high jump rolled into one. Learn, study and experiment is the philosophy of this book. As designers, we are always trying to improve. There are examples of work from different quilt artists, so you are sure to find work that inspires you. Some of the work is breathtaking. I liked Setting The Stage with all its design tips. The activities will set you on track and help you understand the processes involved. Anyone looking to improve their quilt art would benefit enormously from this book. I’m just going to mention a few favourite artists whose work is featured : Gloria Loughman, Ludmila Aristove, Norma Shlager, Sue Benner, Margarete Steinhauer, Paula Nadelstern, Janet Steadman and Robin M. Haller. Superb choice of works to demonstrate the theories. “If you find yourself struggling with the essentials of good design, need a refresher, or simply want a good design reference book, take a look at Adventures in Design, The Ultimate Visual Guide – 153 Spectacular Quilts – Activities & Exercises. Opening the 142 page, full color book, is a beautiful journey down a creative path with Joen breaking down the principles of design, explaining the concepts, showing many examples of quilts and drawings to help illustrate those concepts, and providing activities and exercises to get you going. This is a gorgeous and informative book. While I am honored to have three quilts in this book, I do not exaggerate that everything about this book is first class, right down to the smooth, matte paper used on the cover which feels so good in your hands. The content is broken down into three main sections: Setting the Visual Stage, eight ingredients for great design, which includes the power of design, line and direction, shape, color, value, texture, and visual finesse. Section two is Creating the Visual Dance, a blueprint for superb design which includes ten stellar principles and info on visual balance. The third section is Designing Spectacular Quilts, which merges everything prior to provide design strategies. This is not a how to quilt book. This is not a skim-the-surface of design book. This is a serious design book presented in a beautiful and approachable format that inspires as it teaches. 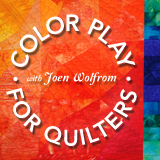 If you have any of Joen’s earlier books, such as Visual Dance: Creating Spectacular Quilts, The Magical Effects of Color, or Color Play (each of which are available as ebooks from Amazon), you’ll want to add this to the collection. If you don’t have those books, the vast majority of quilt makers (and some other artists) will want this one. It retails for $29.95. If you don’t have a local quilt store in your area which you’d like to help support, you can get the book on Amazon at a discount. I have many books on design sitting on my shelves and this one is worth all the others combined. The writing is superb, the illustrations fitting and the suggested exercises inspired. Although I am a quilter, the book would be useful to others working in the arts, including painters. Wow is all I can say. I have learned more about why I like some quilts and don’t like others in the first five chapters of this book than I have in any other quilting or pattern book or magazine I’ve read. I’ve been a quilter for quite some time but I’ve only recently graduated from diligently following other people’s patterns and ideas to designing my own quilts but I struggle with why something that I design doesn’t “look right”. This book more than any other has helped me to understand why it doesn’t “look right” and perhaps how to make it “look right”. I highly recommend this book if you are ready to expand beyond just following patterns and designs you find in magazines.